We've taken a closer look at the Office for National Statistics' new analysis of NHS productivity (first blogged here yesterday by Matt Sinclair). The Big Picture is that since Labour turned on the spending taps, value for money has collapsed. In the most recent five years studied (2001-2006), spending increased by 54%, but output only increased by 19%. Which means that in just five years, for every pound we spend, we're getting nearly 30% less. Just imagine how long Tesco or M&S would survive if they served up that kind of value. Between 2001 and 2006, annual spending increased from £58.4bn to £89.7bn, a rise of £31.3bn. Where has all the money gone? Actually, most NHS costs went up even more than that: labour cost inflation was 25%, driven by those notorious pay settlements (average earnings in the private sector increased by just 16%). The only reason the overall average comes down to 17% is that the unit cost of GPs prescriptions has fallen dramatically, by nearly 20%, apparently reflecting greater use of generic drugs. And abysmal NHS performance contrasts starkly with the broader economy, where productivity rose by 10% during the same period. Once again, boom and bust political management ramped up spending far faster than a decrepit old nationalised industry could handle, and much of the cash was simply wasted. But there's also a much bigger message struggling to get out. Labour inherited an NHS budget growing at 5-6% pa. In the five years from 2001 to 2006 they ramped it up to 9% pa. 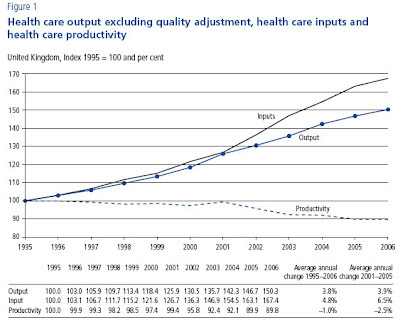 Yet output performance barely changed, increasing from c 3% to just c 3.5% pa (even less excluding GPs prescriptions). Why is that? Could it possibly be (as the recent TaxPayers' Alliance paper suggested) that the key driver of healthcare improvement in the NHS is not how much we spend, but worldwide advances in medical technology? And if that's the case, why are taxpayers being made to spend all this additional money? We surely all understand that a nationalised healthcare system will never match the efficiency of systems based on choice and competition. And we surely also understand that a tax-funded free-at-the-point-of-use healthcare service will always need rationing. Instead of pretending the NHS can deliver it all, perhaps we should consider a cheap and cheerful tax-funded safety net, coat-tailing on foreign technology. Which of course is pretty well what the NHS has been for some considerable time... except for the cheap and cheerful bit, obviously.